There’s just something about work boots. IRONCLAD Marketing recently sent out three-month planning calendars to our clients, companies we’d like to do work with and friends. They’re a reminder that the goal of any advertising, marketing or public relations effort is to create a lasting impression, and that impression is only a stepping stone to the greater objectives of better leads, stronger sales and greater customer retention. In short, every marketing piece or effort should help build a stronger company or organization. Overall, the message is that success requires planning, and planning with IRONCLAD leads to a step-by-step path that will help you build a more formidable company today, next month and throughout the coming year. 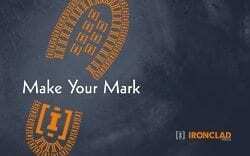 Entitled “Make Your Mark,” the piece features – you guessed it – the print of a work boot (with an IRONCLAD touch, of course). I love it; I hope it catches your eye, too. I’ve been with IRONCLAD for about two months now. I’m delighted to be with a team that works with companies that know the true meaning of real work. The majority of our clients build amazing equipment and tools, from small, remote- controlled drilling and demolition machines to massive truck bodies that can haul thousands of tons of iron ore. These are companies that make the jobs and lives of working men and women around the world easier and more efficient. I’m also delighted to be working with people in a class agency. The folks around here bring the fabled Midwestern work ethic to the office every day, and they pound away at one of IRONCLAD’S brand promises: We strive to earn our clients’ trust and business every day, with every idea, every word, every design element, every project. In other words, with every boot track.